Will Ben Stiller Create an “Angelina Jolie Effect” With Prostate Cancer? Actor and comedian Ben Stiller announced that he was diagnosed with prostate cancer at the age of 48, in part because of prostate-specific antigen testing. In 2000, television news anchor Katie Couric underwent a televised colonoscopy to promote colon cancer awareness month. In 2013, actress Angelina Jolie announced that she had undergone preventive double mastectomy at age 37 because she carried a BRCA1 gene mutation. Both were decisions that created huge publicity and led to increases in colonoscopies and genetic testing. What kind of effect does celebrity influence have on health care screening for cancer? 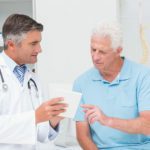 In a blog post detailing his experience, Stiller describes how his physician initially tested his PSA at age 46 with follow-up testing every 6 months thereafter for more than a year and a half. After watching his PSA level rise, his physician referred him to an urologist for a prostate exam, who subsequently recommended an MRI. Stiller ultimately underwent a biopsy, and was diagnosed with intermediate grade (Gleason 7 [3+4]) prostate cancer. Stiller credits the PSA test and his physician who performed the test for saving his life, despite the USPSTF guidelines recommending against PSA screening and the American Cancer Society advising the discussion about screening to take place at age 50 for men at average risk of the disease, like Stiller. Stiller is now advocating for men in their 40s to discuss early PSA screening with their physicians. Stiller B. The prostate cancer test that saved my life. Medium website. https://medium.com/cancer-moonshot/the-prostate-cancer-test-that-saved-my-life-613feb3f7c00#.agu4filsc. Updated October 4, 2016. Accessed October 5, 2016. Prostate Cancer: Screening. U.S. Preventive Services Task Force website. https://www.uspreventiveservicestaskforce.org/Page/Document/UpdateSummaryFinal/prostate-cancer-screening. Updated May 2012. Accessed September 2016. Close more info about Will Ben Stiller Create an “Angelina Jolie Effect” With Prostate Cancer?